Scientists have uncovered evidence for another natural cycle that, like El Niño and La Niña, shifts Pacific Ocean winds and currents and rearranges rainfall and weather patterns around the globe. The newly detected cycle recurs every 100 years, less frequently than the two-to-seven year El Niño-Southern Oscillation. But its existence, if confirmed, offers another fundamental cog to understand the ocean-atmosphere machinery that regulates worldwide rain, droughts, wildfires, floods, landslides, fisheries, and storms. The new cycle, called the Pacific Centennial Oscillation, was reported in the September 2012 issue of Journal of Climate. It provides a deeper understanding of how natural cycles may interact with manmade global warming to produce far-reaching climate impacts emanating from the Pacific region. “We base many of our conclusions about regional aspects of climate change on instrumental records we’ve obtained over only about 150 years, and so we might just be scratching the surface in terms of what is going on naturally over centennial timescales,” said Kris Karnauskas of Woods Hole Oceanographic Institution. 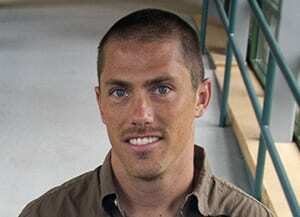 He is lead author of the new study, with colleagues Jason E. Smerdon and Richard Seager of Columbia University’s Lamont-Doherty Earth Observatory and Jesús Fidel González-Rouco of the Universidad Complutense de Madrid. 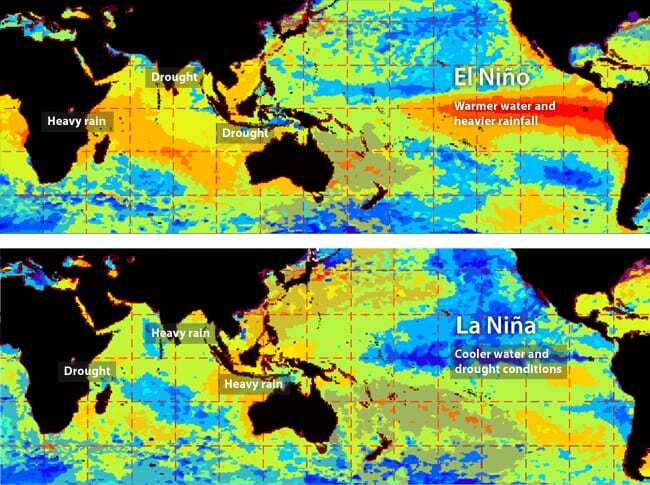 With a little more than a century of data gathered with ships, moorings, and satellites, scientists have become well acquainted with El Niño and La Niña, in which water temperatures cycle like a seesaw, becoming warmer and cooler over the course of several years in the eastern tropical Pacific off the coast of South America. 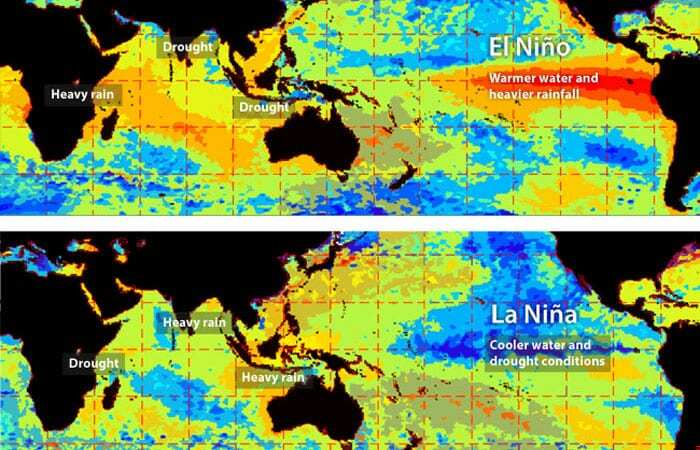 Warmer waters in the eastern Pacific (El Niño) disrupt the atmosphere typically found over the cool waters, triggering a reduction or reversal of the westward-blowing trade winds. That, in turn, has far-reaching reverberations: It shifts evaporation patterns over the ocean that transfer moisture to the atmosphere; it reshuffles atmospheric circulation, generating atypical weather from Australia to America; it diminishes upwelling of cooler, nutrient-rich waters that nourish fisheries. La Niña, in which the eastern Pacific gets abnormally cooler, has similar, but opposite impacts. Understanding Pacific Ocean phenomena such as the El Niño-Southern Oscillation helps forecasters predict how Earth’s climate will respond to global warming. But to investigate patterns that might be at play on longer timescales, Karnauskas and colleagues were interested in how tropical Pacific Ocean temperatures behaved if viewed over 1,000 years, rather than several decades. To do that, they harnessed the power of computer models used to make projections of future climate. The models weave together a variety of interacting physical processes in the atmosphere, ocean, ice, and land that combine to create climate conditions. The complexity of these models requires intensive computing power and long run times; so the models are usually used to simulate only the last and upcoming centuries—to ensure that the models reliably replicate the past and then to see how they predict future climate scenarios. Karnauskas and colleagues analyzed three separate global climate models that simulated thousands of years of past ocean and atmospheric dynamics on Earth, with or without human activities factoring into the results. By removing the din of human industrialization, scientists can hear the natural signals of baseline conditions in nature. All three models produced a strikingly similar pattern: In a 100-year cycle, waters in the western Pacific near Indonesia and in the northeastern Pacific, near the west coast of the United States and around Alaska and Kamchatka in Russia, all became warmer than normal; waters in the eastern tropical Pacific near South America and in the northwestern Pacific (near China and Japan) and the southwestern Pacific (near northern Australia) became cooler. That pattern flip-flopped, then returned roughly each century. The model simulations also revealed important climatic impacts from this Pacific Centennial Oscillation. 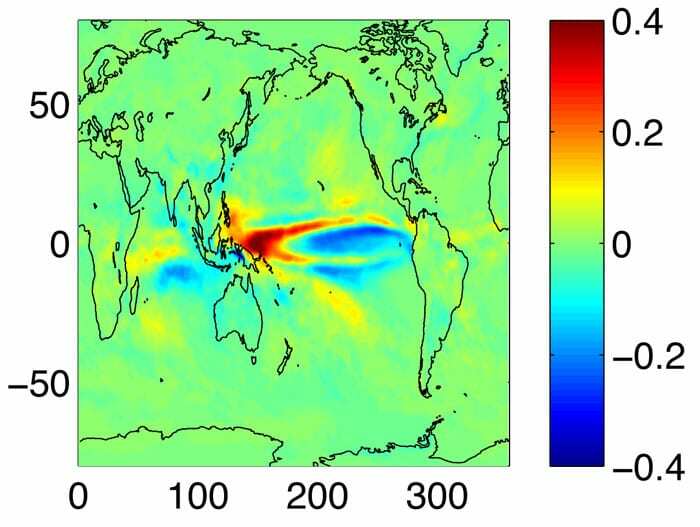 The pool of warmer water in the western tropical Pacific triggered atmospheric waves radiating in both directions toward Earth’s poles, which significantly altered wind patterns over the North and South Pacific. These atmospheric changes strongly influenced storm tracks through mid-latitudes on both sides of the equator, as well as water conditions that affected coastal fisheries in California and Alaska. 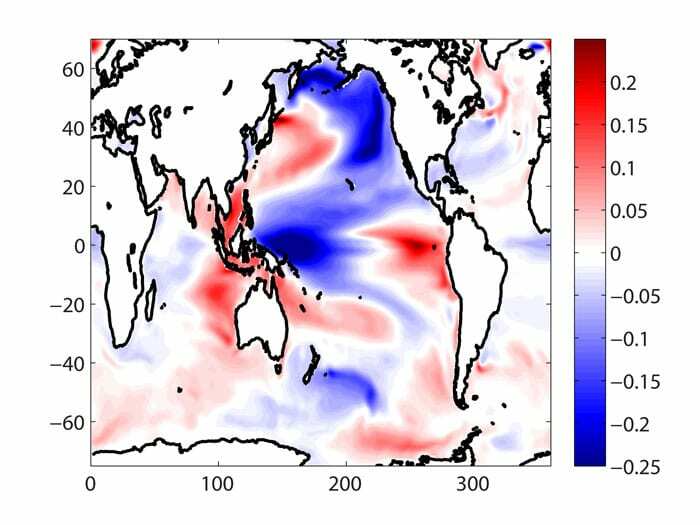 The Pacific Centennial Oscillation also greatly altered rainfall in the tropics, with important ramifications for agriculture and water supplies in some of the world’s most vulnerable regions, Karnauskas said. Of course, the model results are theoretical. Karnauskas said he hoped the finding will motivate scientists who study past climates to take the next step: searching for records of past Pacific Ocean temperatures lodged in coral skeletons and seafloor sediments to verify the Pacific Centennial Oscillation predicted by the models. Fortunately, many of the areas that appear to be affected by the Pacific Centennial Oscillation host abundant reefs that may be queried to see if the 100-year cycle exists, and if so, where in that cycle we are today. This research was funded by the Reuben F. and Elizabeth B. Richards Endowed Fund.